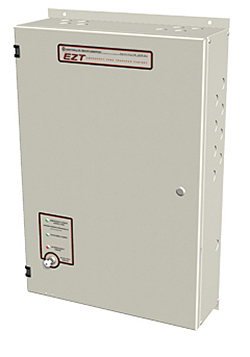 SwitchLITE Model EZT (Emergency Zone Transfer Cabinet) automatic transfer switch allows dimmable lighting fixtures to function as essential emergency lighting. The switch automatically transfers 4, 6, or 8 individual 20-amp branch circuits to emergency power when normal power fails, and then back to normal power once it has been restored. Upon transfer to emergency power, lighting fixtures that are dimmed (or off) are brought to full illumination to provide safe egress.